dominant genes and recessive genes. 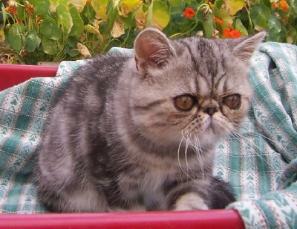 pattern inheritance involved in Silver Tabby Exotic breeding. one from mom and one from dad. Shorthand notation for heterozygous is htz. Let's think of Fluffy again, your black Exotic girl. making her color gene black. She will have one dilute gene (d) and one non-dilute, or dense (D). male who has one or two dilute alleles. We would say that Fluffy is heterozygous for dense color. Her alleles for color dilution are different. heterozygous for short hair, a dominant gene. Her alleles for hair length are different. depending on the genetic make up of her mates. Shorthand notation for homozygous is hmz. 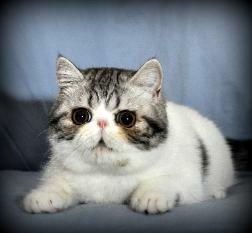 colored cats in her pedigree appear in the 4th generation with her great-grandparents. there will be no dilute colored kittens in her future. We would say that Fluffy is homozygous for dense color. Her alleles for color dilution are the same. homozygous for short hair...a dream! she is said to be homozygous for short hair. Both of her alleles for hair length are the same. This means she will only produce shorthair kittens, no matter the hair length of her mates. can be talked about as heterozygous or homozygous for that trait.